Thank you for such a wonderful game! I can't believe how many hours of enjoyment myself and my family have had from this. Your jigsaw game is wonderful value for money, for only 22 bucks I have had countless hours of fun, thank you too for updating your site with new jigsaws, even though I have already brought it. It proves you really do care about your customers..
Yours is simply the best jigsaw game I have seen (and I have seen a few! ), it has more features and is cheaper than other jigsaw programs, I will be purchasing this one! I had a lot of fun with this, as did every member of my family, its simple to use and very addictive! I would recommend this one! I loved this jigsaw game, it has so many cool features. I really like the way you can have as many pieces as you want in a puzzle, and, unlike most other jigsaw games you can actually keep track of where all the pieces are (because of the overview window thing). 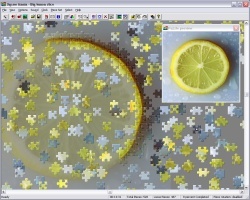 I also really like the way you can download new jigsaws off the web, it's like you get free jigsaws all the time. I give Jigsaw Mania two thumbs up! This game has everything a good game should have; good smooth graphics, tons of features, solid stability, and most importantly it's very fun to play! you can sit and play this for hours! I'm 58, usually I dont play computer games as they are hard to figure out, but this game was pretty easy to use. Even though it's a simple idea it's still addictive, my kids are gonna have great fun with this game. Bravo Jigsaw Mania! lots of features, lots of puzzles, lots of fun. I think this program is a great idea, I have since brought the full version. My family loves your game, it keeps our children happy for hours! I really like the way you can make your own jigsaws, I have sent all my family my own jigsaws using the e-mail feature. This is simply the best �12 I ever spent on software, I would recommend it to anybody!